Lejlighed på 75 m2 med storslået udsigt over den gamle bydel. Fantastisk lejlighed beliggende i en århundredes bygning, fuldt renoveret i hjertet af Girona. Den fuldstændig renoverede lejlighed er beliggende i den gamle bydel i Girona, ved siden af ​​Plaza Catalunya. Det er fordelt i et åbent køkken udstyret med alle nødvendige apparater, tv og sovesofa. Fra spisestuen har du adgang til en indvendig terrasse, udstyret med et bord og udsigt over de indre haver. De to værelser har dobbeltseng og klædeskab. Begge værelser har adgang til deres private balkon med udsigt over muren og katedralen i Girona. De to badeværelser har et brusebad, håndvask og vask. Lejligheden er udstyret med et klimaanlæg. Lejlighed beliggende 3 minutters gang fra det kommunale marked León. Det kommunale stadion Montilivi ligger 15 minutters gang derfra. RENFE-AVE togstation og bus 10 minutter til fods. Lejlighed beliggende 20 minutter fra Girona Lufthavn i bil og 1h15 minutter fra Barcelona Lufthavn. Det har hårtørrer, separat håndklæder og sæbe / shampoo. We stayed for 10 nights and enjoyed Girona and the surrounding. We had a very friendly and well working welcome by Carme. The flat has some advantages, it is great enough for 2 and is well located near the old town. The machines like washing machine all work and the shower is pleasing. In the night it is sufficiently quiet, if the windows are closed. But there are some things that made our stay uncomfortable. Unlike as written in the description there is no private parking. You have to search for a parking place in the streets. Some are for free but everyone wants to stay there; for some you have to pay but it’s not cheap and you can only pay for two hours. (Btw: the app e-park, which was recommended, only works for Spanish citizens). A lot of cars are driving around searching for a parking place. The shower streams out a fetidness. The description suggests that there is a ‚normal‘ coffee machine in the flat, but it isn’t. There is only a Nespresso machine. There are not 6 comfortable seats in the flat as mentioned. Two seem to be the sofa but it is worn-out and not convenient. And four seats are basket chairs, it is not comfortable to sit there, especially at the table. When we came back from a tour and wanted to relax we choose the beds. But as for sleeping, one of the mattresses seems to be old and used up. If you only want to stay for two days and just visit Girona itself, if you are fit enough to climb the very small stairway to the third floor and if you don't travel with your own car (with a lot of stuff in it), this flat may be recommended. If you are looking for a holiday home discovering all the beautiful places in Girona and Catalonia, we wouldn’t recommend it. 1-Nosotros alquilamos apartamentos,no parkings para coches,en ningun momento ofrecemos parquing privado sino que comentamos la posibilidad de encontrar parking gratuito en la calle;como usted afirma.El parquimetro funciona correctamente para ciudadanos españoles,alemanes y de todo el mundo,no hace discriminacion por pais de procedencia. 2-Usted reservo el apartamento para dos personas y por el comentario que hace deducimos que fueron mas de dos personas. A-siendo dos personas ¿ para que necesitaban 6 sillas? 3-El baño estaba perfectamente y no podia "arrojar fetidez" por el motivo de que es un tercer piso.Desconocemos a que se refiere en todo caso tenia nuestro telefono de contacto para solucionar cualquier anomalia,en ningun momento nos comunico nada. 4-Existe como muy bien dice una maquina Nespresso para café,gentileza de la casa así como capsulas gratis de cafe;NO tenemos ninguna obligacion de tenerla,al mismo tiempo veo que no comenta que tenia a su disposicion y de forma totalmente gratuita:bolsa de The,sal,azucar,aceite de girasol,aceite de oliva,pimienta,y cosas varias para su estancia. 5-El apartamento dispone de tres habitaciones,con tres camas dobles con tres colchones,SON DOS PERSONAS y se queja de que un colchon "parece" viejo y desgastado;muy lejos de la realidad,los tres son comprados por igual y no tienen mas de un año. POR ULTIMO: nuestros apartamentos aparecen en varias plataformas digitales obteniendo la maxima puntuacion y admiracion de nuestros clientes. 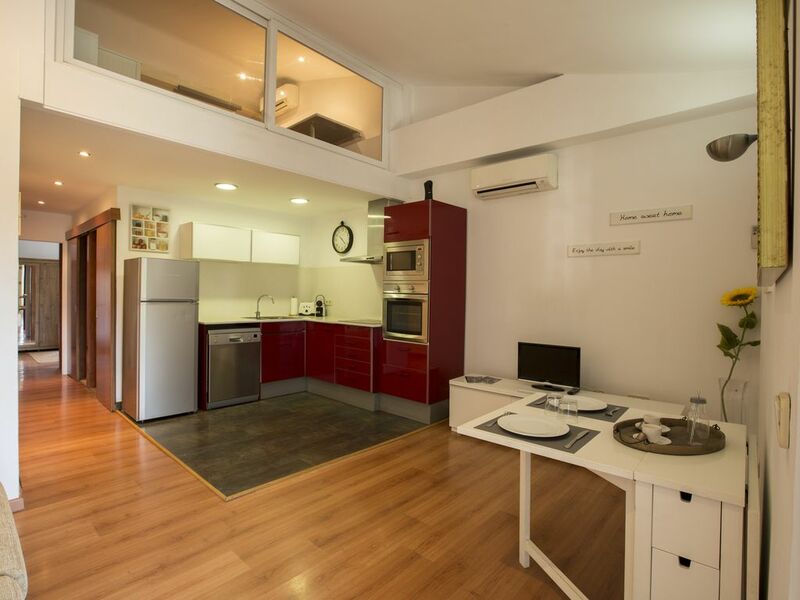 Ustedes (2 personas)tuvieron a su disposicion un apartamento de 80 m2 con tres habitaciones dobles,dos baños completos,cocina totalmente equipada y en perfecto funcionamiento,comedor con terraza cubierta y sol todo el dia.PUDIERON Y UTILIZARON LAS TRES HABITACIONES cuando solo deberian utilizar UNA. 3ème étage sans ascenseur . Selve byen er allerede et museum for antikviteter og historiske anekdoter, hvor de filmede en del af den berømte serie Game of Thrones, og flere andre film. berømt for sin gamle bydel og jødiske kvarter, hvor du kan fare vild i sin labyrint af gader. Også byen Girona er en attraktiv cicloturismo besøgende, provinentes fra hele verden.